DUB IS A WEAPON celebrates the 12 year mark by finally releasing their earliest work on vinyl! ! Leader DAVE HAHN has been kicking around the New York music scene for a while, playing ska with THE SLACKERS and STUBBORN ALL STARS, Afrobeat with ANTIBALAS, plus working as a dub engineer for the EASY STAR ALL-STAR’S Dub Side of the Moon tour. Did we mention DIAW was the backing band for LEE “SCRATCH” PERRY’s 2006 tour? “FROM THE VAULTS” was recorded in 2001 in the heart of Brooklyn, with a truly all-star cast that has never been duplicated to date, including VICTOR RICE, EDDIE OCAMPO, VICTOR AXELROD (aka TICKLA), Jamaican legend LARRY McDONALD (worked with MARLEY, TOSH, TAJ MAHAL, GIL-SCOTT HERON, BAD BRAINS) plus CONGO ASHANTI ROY and ROB SYMEONN on vocals. 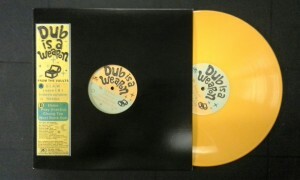 Limited edition of 400, pressed on yellow colored vinyl. Art designed by Chema Skandal.